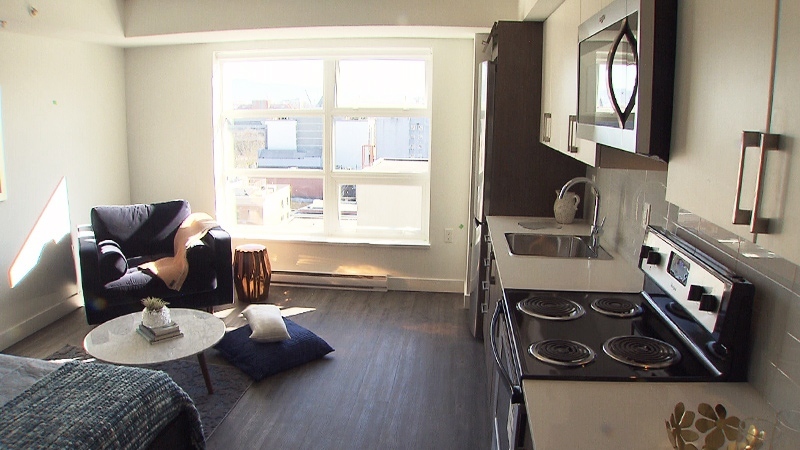 An affordable housing project aimed at helping women living in Vancouver's most notorious neighbourhood is renting apartments for rates between $375 and $1,561. The Olivia Skye building, located at 41 East Hastings St. in the city's Downtown Eastside, holds nearly 200 suites of "affordable" rentals for different levels of income. While the neighbourhood would typically not be described as scenic, some apartments have views of Coal Harbour and the downtown skyline. One studio CTV News viewed on Friday had a 500-square-foot balcony with a sweeping view of the North Shore mountains. Inside, the units range from 389 square feet to 645, with most being between 400 and 500. The building boasts a common lounge, deck with built-in brick barbecue and a gym, and cable is free for the first year. B.C. housing minister Selina Robinson said that the project represents hope for many women and families in need. "It can be difficult to feel hopeful about housing or shelter in Vancouver when affordable housing is out of reach for so many people," she said. "Those who will call this place home, including women who are having a tough time finding any place to live, will have the safe and secure housing that they need. They will have the home that they need. It will be a fresh start, an opportunity to create a life that they want." Fifty-two studio apartments are reserved for single women on income assistance, and will be rented at the maximum shelter rate of $375 a month. The building's operator, Atira Women's Resource Society, said another 68 bachelor apartments will be available to single renters or couples earning between $30,000 and $48,000 a year – an income tier based on B.C. 's housing income limits. Those units will be rented at rates between $750 and $1,000 a month, though some will be set aside for elderly women who may have a lower income but are eligible for the Shelter Aid for Ederly Renters supplement offered through BC Housing. The remaining 40 per cent will rent for more than $1,200 a month, to single tenants and couples bringing home up to $85,000 a year. Would-be tenants can apply for bachelor apartments available for $1,242, while those looking for a one-bedroom will pay $1,561. The priciest pads in the building will be available for those whose household income is between $48,000 and $85,000 annually. Those who earn as much as $85,000 might not be considered in need of affordable housing in most Canadian cities, but Vancouver's near-zero vacancy rate means one-bedroom apartments on the traditional market often rent for much more than $1,500. And even those who can afford to pay a bit more may struggle to find available housing. "We are thrilled every time we show someone who earns a moderate income an amazing home they can afford, and even more so when we offer a woman a home she never dreamed she would have," Atira CEO Janice Abbott said Friday. Still, it may be a challenge to find tenants who can afford low-end market rent and want to live on East Hastings. CTV News showed photos to people in Vancouver who felt like the prices were a deal, but when they found out the location, they were hesitant. Some said they'd feel uncomfortable living on the block, while others said they didn't feel attempts should be made to gentrify the neighbourhood and change the community. "The issue is so systemic. It's not anything that you can just go in and change by providing housing for people," one person said, adding he'd lived in the Downtown Eastside at one point. "Not to lump everyone together, but the way they feel as a community is that's where they live, that's their home. 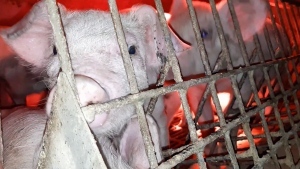 They don't feel comfortable going outside of it." But the location was intentional. "Olivia Skye will provide almost 2000 new homes… for those who need it most, particularly women who are living in the Downtown Eastside and struggling to find safe and affordable housing," Vancouver Mayor Gregor Robertson said in a statement. The building was funded by the federal and provincial governments who each contributed $9.02 million to help build the 52 units for single women as part of their affordable housing initiatives. The City of Vancouver contributed a capital grant of $1.2 million and waivers and exemptions worth $1.18 million to secure affordable rental housing for Vancouver women. The Streetohome Foundation also contributed more than $1 million with contributions from the Carraresi and MariaMarina Foundations. A studio apartment at the Olivia Skye building is seen Friday, March 16, 2018 in Vancouver.